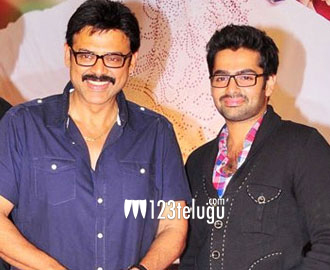 Venkatesh, Ram starrer Golmaal is fast nearing completion. Except for two songs, the rest of the film’s shooting has been completed. Directed by Vijay Bhaskar, the film also stars Anjali and Shazahn Padamsee in lead roles. Sravanthi Ravi Kishore and D Suresh Babu are jointly producing the film. Golmaal is the official Telugu remake of Abhishek Bachchan and Ajay Devgan starrer Bol Bachchan and plenty of changes have been made to suit the Telugu nativity. The entire cast is surprised at the pace with which Vijay Bhaskar has shot the film and in fact, Ram revealed that it’s his fastest films ever. The film unit will soon go abroad to can one song each one Ram -Shazahn Padamsee and Venkatesh-Anjali. More details about the film will be revealed soon and it’s expected to hit the screens later this year.